I am jumping up and down that this week is almost over! I'm feeling better, our new dishwasher is coming in tomorrow (hand-washing dishes all week for a family of five is the pits), we're starting spring break after today, and the card I just made is perfect for the new CAS-ual Fridays challenge. 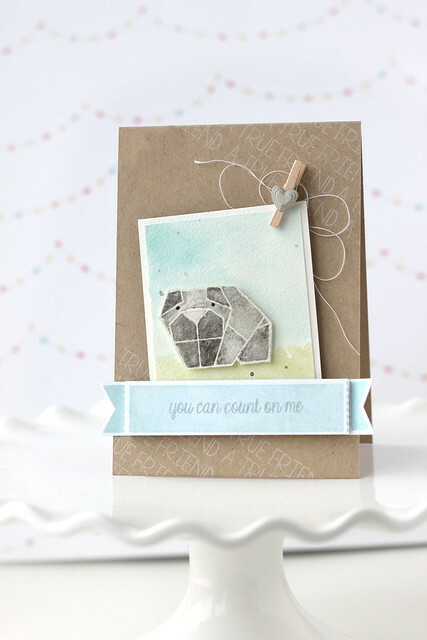 I'm loving the new origami stamp set by Mama Elephant. It crept up on me. I didn't know how much I would love it at first glance, but there is so much you can do with it! Did you happen to catch Emily's origami Yoda? so clever. I water-colored my pooch in shades of grey for a softer look. I heat-embossed the dog image and let the paint bleed around quite a bit before cutting it out. The background panel was also watercolored. Swipes of blue and green were painted very quickly, and then speckled with more grey paint. I layered the hearts from the confetti dies and stuck them onto a clothespin. I love the look of it. 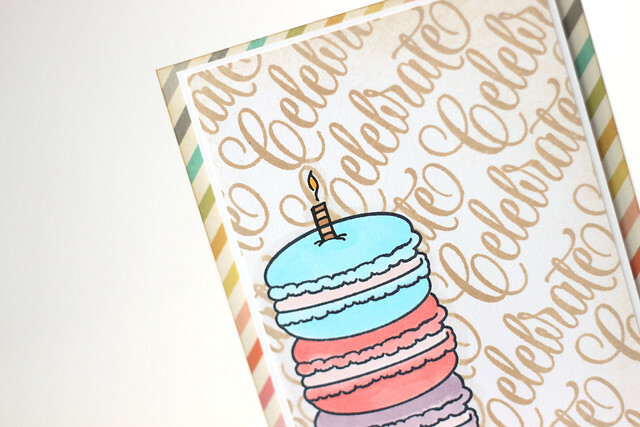 I found a bit of free time this week, and my Avery Elle stamps were still sitting on my desk, so I decided to create another card for their birthday challenge. I started out with a piece of white cardstock, and stamped the macarons (masking as I went down the tower.) I then masked all four of them, and stamped the flourish-y "celebrate" over the entire panel. The candle was hand-drawn... mostly because I couldn't be bothered to get up and look through all of my stamps just to find a single candle image in the right size. ha. It felt good to ink up new stamps, by Avery Elle, and enter a few challenges. I lifted the flower arrangement, in shades of pink. I inked up the florals with a light pink ink, but used a sponge dauber to add darker pink to a few flowers before stamping onto my cardstock. 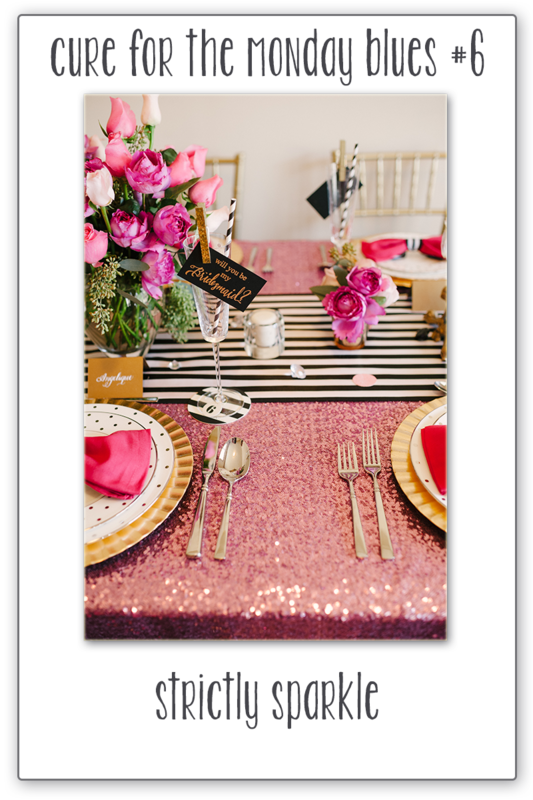 The striped table runner features as a chevron background. And all of the gold! I made good use of my glitter tape, even on the tiny clothespin. I hope you like it! I'm also entering the AEIHeartU challenge, which is all about birthdays. I think you can celebrate anything you like, with this card. I know this post is gonna seem a little out of season, but it was perfectly timed when we celebrated my niece's 1st birthday a day after Valentine's. My sister and I planned and baked a very tiny celebration for the tiniest (and cutest) one-year-old. Seriously, she weighs in at only 15 pounds and is the daintiest little lady. I knew we needed a solid prop or background to ground our party table. This one cost me 1$, and took up under 2 hours of my time. I cut a heart-shape out of a large cardboard box we had in our garage (the backside shows off the Sharp tv we recently bought for our basement) and I covered it in layers of fringed crepe paper. You know the roll of streamers you can buy for 1$? I went to town on the roll with my Martha Stewart fringe scissors and then taped down layers, starting at the bottom, and working my way to the top. I lopped off the bottom of the heart so that it would stand up straight on the dessert table. The easiest trifle-topping banner, thanks to my silhouette cutter. a chocolate mold and red candy melts made for very cute cupcake toppers. I also used the same red chocolate hearts on my batch of sugar cookies, and Melissa piped red hearts onto her white cake pops. Try as we might, perfectly round cake pops are the impossible dream... haha. All of the paperie was created so simply: I used wplus9's knit stamps, lawn fawn's heart dies, and their quinn's abcs. The favors were created by spraying the lids of Amelia's baby food jars, filling them with Valentine candy, and sealing them with a simple tag. I hope you like this peak into Amelia's first birthday! It's the last day of Mama Elephant highlights and we're showing off "sketchy letters." My card is totally tongue-in-cheek. I gave my monocle-d bunny a glassy eye, with the help of glossy accents. The panel was grounded using the femme frames - I cut both the rectangle and larger scallop frame in one pass, instead of layering the white mat over-top. The bunny looks like a cheeky fellow, and the playfulness of the sketch letters font adds to his mischievousness. I hope you like it! Check out the Mama Elephant blog for more sketchy letters inspiration! Welcome back to another day of Mama Elephant inspiration! 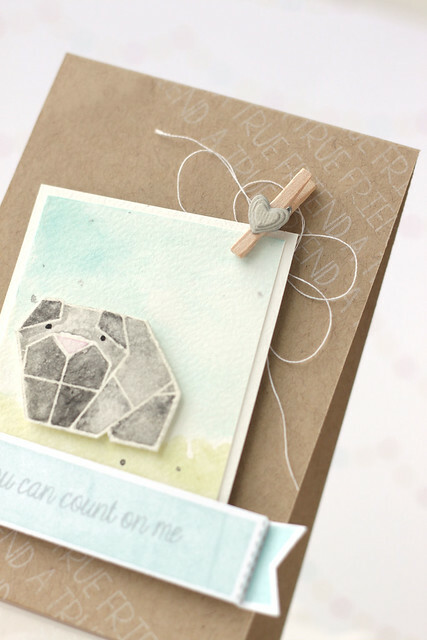 We're showing off the new stamp set, origami. I love that, depending on how you color them, many of the animals could resemble something else. In shades of orange this guy looks foxy, but there's some cat-like about the shape too, no? The fox rests over a watery-blue panel. I masked the edges, rubbed distress ink over the panel and then splashed some water on it. I love the effect. I can't get enough of these confetti dies. I had to close-up on one just to show it off again. Check out the Mama Elephant blog for more inspiration! Sorry if this write-up seems a bit choppy - my head is all stuffed up and woozy. bleh. This is my second post of the day! 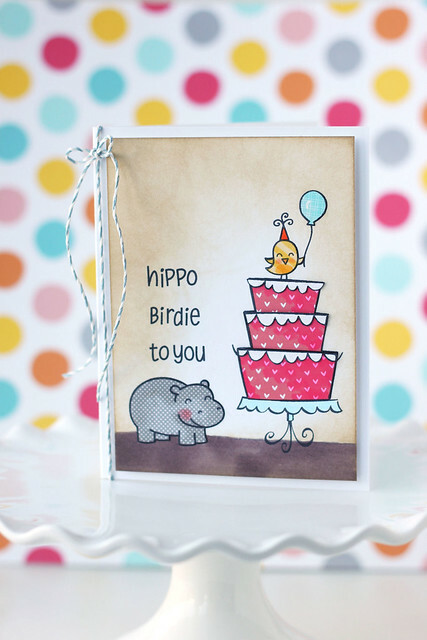 Scroll down or click *here* to see my lawn fawn inspiration week card. The mama elephant team is highlighting the new set, true friend. It's full of great sentiments in the perfect mix of fonts. I used one sentiment on yesterday's card. Forgive the photo - this was one of those muted cards that refused to be photographed. bah. I do love it better in real life. I stamped the uplifting sentiment onto the rectangular block included in the set. I framed it on either side with images from honey bunny. The clouds were die-cut from vellum and treated to some blue stitching - super easy to do, since the holes are already made for you! My favorite part has to be the origami bird - all sparkly and 3D. I cut some extra pieces and adhered them with the ends curled out for extra dimension. I hope you like it! Check out the Mama Elephant blog for more true friend inspiration! Welcome back to another day of lawn fawn's inspiration week. Today, we are showing off "wish you were here," a set I wasn't sure I'd get much use out of.... with the hugs american map in there and all... but it turns out I love it! I combined wish you were here with #awesome to create a baby card with an instagram-vibe. All of those hashtags, hee hee. I stamped the globe first, then heat-embossed the sentiment (the "hello" and "world" were nabbed from separate sets) before stamping the chevrons in the background. I did some pink inking over the entire panel, to simulate an instagram filter. I hope you like it! Visit the lawn fawn blog for more wish you were here inspiration. this is my second post of the day! scroll down or click *here* for my lawnscaping card. I paper-pieced the bunnies, and have them sitting atop the banner from "true friend." I love the sentiment, also taken from that set. Using a ruler and a black pen, I gave the banner an outline. I think it's a fun way to get a different look out of a solid stamp. The confetti. oh my, the paper confetti. I love the new dies. You could leave them flat and they're amazing, but I played with them a bit to get extra dimension. Visit the Mama Elephant blog for more "honey bunny" inspiration! Mine is all unicorns & rainbows. I pieced together the sentiment from some of the newer lawn fawn sets (#awesome and let's roll) and stamped the rainbow from starry backdrops. The unloved unicorn from critters ever after gets a facelift when paired with these newer stamps. Did you notice the journaling card die? Some careful die-cutting and I was able to create a longer panel to fit my images better. Welcome back to another day of lawn fawn inspiration! Today is our showcase of "year four" and "spring showers." I paper-pieced a birthday scene, with a birdie on top. The new let's polka papers are perfect for paper-piecing, and in the most fun colors. 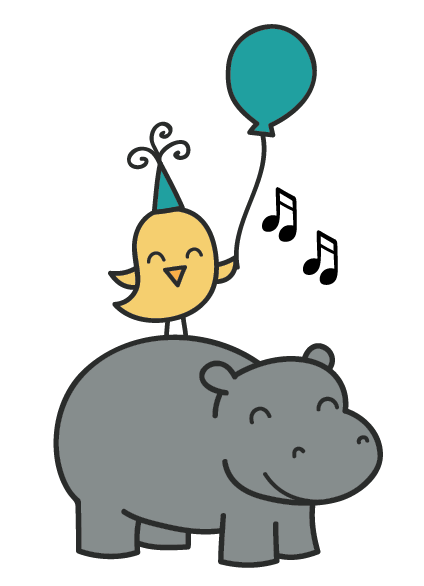 The background was inked with different shades of brown inks, and the birdie sits atop a bake me a cake cake. To finish things off, a handsome twine bow with the tails left long, to give more balance to the card. I hope you like it! Check out more design team projects on the lawn fawn blog! This is my second post of the day. Scroll down or click *here* for my lawn fawn inspiration week post. Welcome to the Mama Elephant February stampede! All of the new stamps are in the shop already, ready for purchase. For my card, I used my favorite set of the release, honey bunny. I propped the bunny onto the shelf from nursery deco, and added the sentiment underneath. The stripes on the card base were created using a ruler and black copic marker. Nothing could be easier. It provides a graphic backdrop to the gold stars. I used the falling hearts stencil, from Simon Says Stamp, and gold embossing paste. I masked the bunny before applying the paste so that a few hearts look seamlessly tucked behind him. Welcome back to another day of lawn fawn's inspiration week! 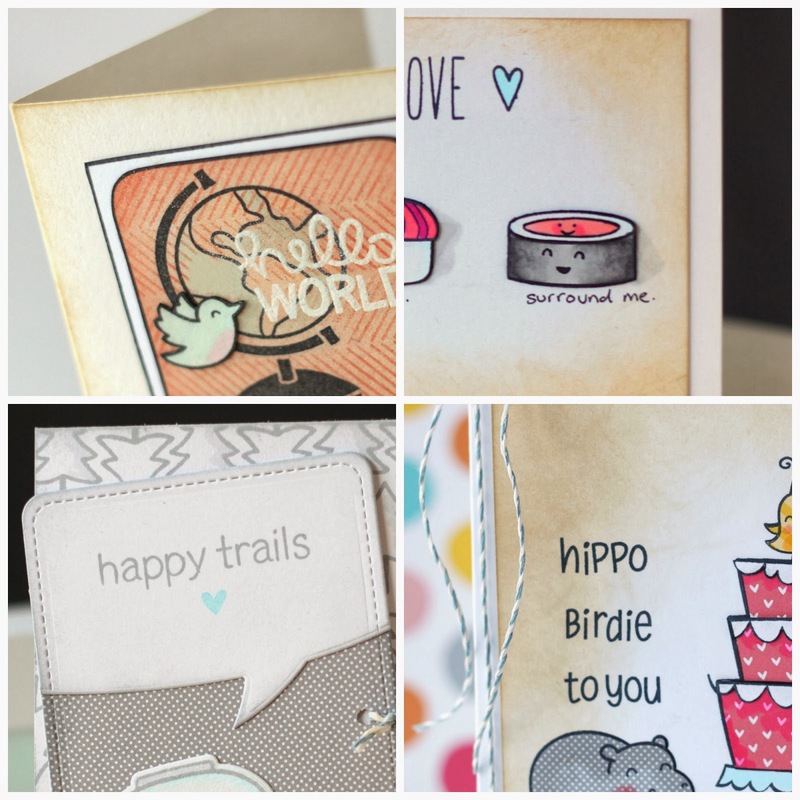 Today, we're featuring the speech bubble border and the new "hello" die. I like matchy-matchy gift sets, so I found a silhouette file for a camper candy box and put it together with a camper card. I stamped out the trees from happy trails to fill the card base, shading each one ever-so-slightly. The main panel (the journaling card die) features the speech bubble die in 2 ways: as a speech bubble at the top, and as the hill-y bottom. ps, if you decide to make this camper candy box, be warned: it is such a flimsy design. I had to build a proper bottom for it myself, for it to even work as a candy box. pfffft. Happy Valentine's Day! What better way to celebrate then to tell you all how I like to be loved. hee. Lawn fawn is kicking off this month's inspiration week with a closer look at "let's roll." This set is the cutest ever, y'all. I used Milo's abcs to spell out my custom sentiment, added a band around the middle sushi, and inked up the entire panel. I don't know if you can tell, but I had some creative inking going on to manage that sushi roll on the right. Tricky, but worth it. I wish I could take credit for this idea, it's so clever, but I saw a print somewhere and had it swimming around my head ever since. Be sure to check out the lawn fawn blog for more inspiration today! I made another sushi card last week! Click *here* if you missed it. Any special plans for the day? It's 1am and there's a blizzard happening outside my window. Fingers crossed for a snow day! lawn fawn inspiration week begins! It's been quiet on the blog this week, but that's all gonna change. starting tomorrow. 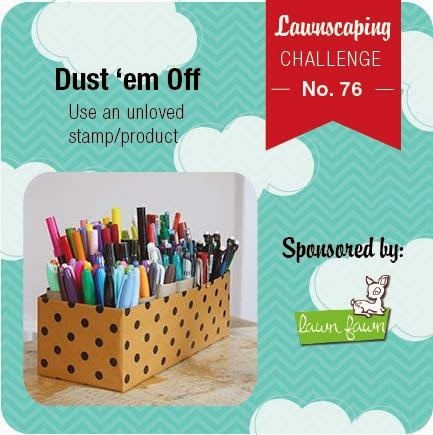 Lawn fawn inspiration week starts today with their big giveaway post! Some you've seen before (from their CHA sneaks) but I've never shared them on the blog. And a few are brand new. Happy Sunday! One thing I love about crafting and blogging is the friends I've picked up along the way. My buddy and fellow canuck, Meredith, makes the most gorgeous vintage cards, with ribbons and layers that I can only dream of re-creating. To celebrate a new, love-themed kit in her shop, she's asked a few bloggers to create cards using its items. I love the time card included in the kit! My first instinct was to have a really cheesy "i'd love to spend all my time with you" sentiment, but I opted for something a little more classy. hee. The sequins included in my kit are shades of pink, and perfect for creating a little shaker. I added teeny-tiny hearts in hot pink and white to fill in the area. I hope you like what I've created! There's more to see here: Meredith, Laura, Laurie, Wida. Visit Meredith's shop and receive a 10% discount until the end of the month. sushi + wasabi. true love. I love sushi. Not the super fishy kinds (so I'm a wimpy sushi eater) but I dream about eating sushi. I just decided my hubs and I are doing sushi for valentine's day. He'll thank me when I present him with this card. True story: every time we order sushi, the kids get their favorite general tao chicken. Then, they torment their daddy with a game they like to call "we dare you to eat this much wasabi." I've never seen a grown man sweat so much, sitting down. ha. All of the images are lawn fawn: the almost-released "let's roll" and "milo's abcs."